With the speeding encounter between B.D. and Hollywood agent Sid, GBT has critiqued California Highway Patrolmen in a way that rivals Hitchcock. As a military, law-enforcement-type who happened to marry a "babe," it's perfectly plausible for B.D. to consider that "babes are protected by state charter." That same "lawman" thinks nothing of "stripping Sid of his manhood" for simple speeding, or of threatening physical mayhem using the only power he's got. Today's comic is my life. My adult child keeps bringing home people he's befriended who have... assorted problems. This has resulted in a fair amount of breakage over the years, but so far, knock on wood, no significant theft, if you don't count wine. So, although of course I sympathize with the women in principle, I also see where B.D. is coming from. Perhaps, as stated by Boopsie at the time of her birth, Sam is a reincarnation of Mother Teresa -- although at birth she would have been a pre-incarnation, or a simultaneous incarnation (as Mother Teresa was still alive). Great segue between yesterday's classic strip – newborn Sam wants to "feed and clothe lepers" – and today's on her helping the homeless. The Jewish day begins at sunset, so Trump brilliantly tweeted about April Fool's Day on March 31st in a very savvy effort to gain Jewish voters. His 2020 campaign will apparently be the best ever in the history of the U.S.
Ah'm sorry, but I still miss the former page design and the video clips. There were so many neat little nooks and crannies to poke around in. Guess I'm just getting old. But hey, thanks for bringing some small pieces of humor into this mess of a time! it was the Universal Life Church for me and my college roommate. He even had his cactus plant ordained. We still had to protect it from the Draft, though, by moving it off the windowsill. Re the 30-years-ago-today Flashback strip: GBT prognosticated another snapshot from the 21st century -- a sad "bitter, lonely" view! I can relate to today's strip. My wife asked my mother-in-law a political question recently. My mother-in law replied that she would not discuss politics. My reaction was to pick up three oranges out of the centerpiece and start juggling. Yikes! It's Honey! (It took me two panels to realize that.) And all I can think of is the decades-old daily strip where she tells Ambassador Duke that she's sort of running the country, and the Sunday one where she explains she didn't demolish the Great Wall. Good times. You have done a valuable public service by drawing attention to BRI. There are BRI projects under way or in the works all over Latin America, and they are happening mostly under the radar screen. "Colonized Tonga"? Ah, so that's where Minister Honey plans to put the three million people she wants to displace! So well put! Just three years ago it was USA with TPP leading the way, and now...this. How far and how fast we have fallen! Climate change will be the great leveler, so we can still reclaim a leadership role if we do a better job voting and voicing. America does love an underdog story. It's now or never. Wow. In the last strip on today's Flashbacks page ("Even revolutionaries like Chocolate Chip cookies"), Mark says "We'll have to fight to the death to make this country great again!" I would never have picked him for an early Trump supporter! There are clearly still some glitches with the FLASHBACKS page. For instance, the strip in question is labeled as having appeared five years ago, but it actually appeared on December 22, 1970, a few months after the strip launched. Thanks for bearing with us while we try to iron out the weirdness. Reading Franklin Foer's eloquent recap of Paul Manafort's amoral career, I had the strange life-imitates-cartoon sense that I was actually reading Uncle Duke's bio. We all knew Duke's character was initially inspired by Hunter Thompson, but I always assumed that Duke's over-the-top pursuit of corruption and profiteering had no single real-life counterpart. Turns out it's way funnier in the comics than in real life. Gosh, it looks like it was a lovely, early spring (45-years-ago-today) day at Walden when Roland arrived, especially considering he'll soon be introduced to the commune's "marijuana plant" in full bloom. How sadly ironic that the joke of the 40-years-ago-today Flashback strip — Duke saying the NRA wants to bring gun sportsmanship into our once-proud schools — is the reality we now live. "When was Rosie born? How did I miss this? "Were did Rosie come from?" "I realize we have all been distracted, but did you skip an entire pregnancy? Congratulations, Alex and Toggle!" 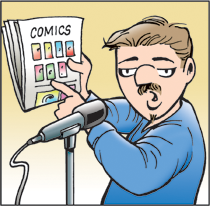 A bit of confusion is understandable, as readers who blinked may have missed the big good news that was revealed in the February 4, 2018 Sunday strip. Wow -- Alex and Leo have a third kid already? Awesome. I remember reading when she was born (and I don't mean in the Classics series -- I mean on the original publication date). Time sure flies.